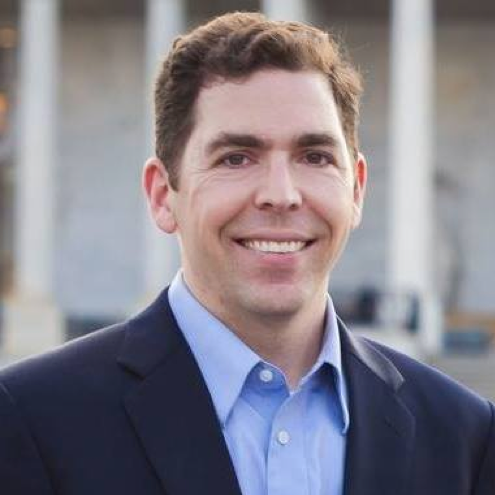 Matthew Scott ("Matt") Bowman is an attorney with a lengthy track record of representing clients in court fighting abortion and birth control access, including the Obama-era birth control mandate. He has made a career out of fighting to roll back reproductive rights outside of the court room, as well: Bowman worked as a full-time anti-abortion activist for years, during which time he was arrested for protesting gay-friendly and reproductive rights policies. 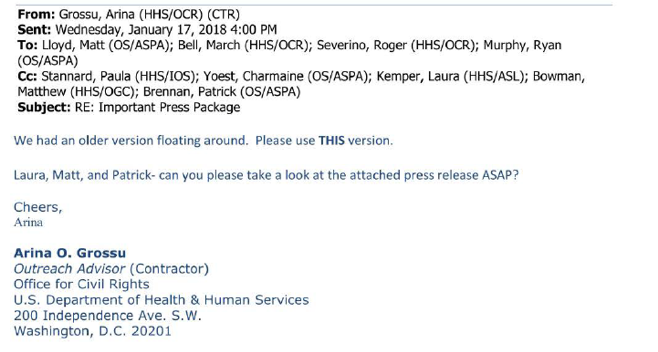 At HHS, Bowman has been credited as a principal author of the Trump administration’s rules to roll back employer-mandated coverage of birth control. 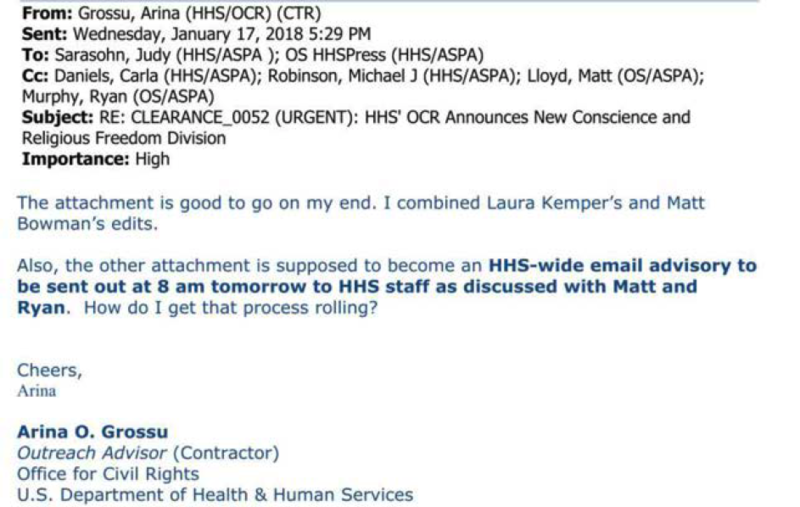 Bowman’s portfolio at HHS includes the Administration for Children and Families (ACF), which oversees offices like the Office of Refugee Resettlement (ORR). Bowman is on dozens of emails providing legal advice to ORR on cases including that of 17-year-old Jane Doe, an undocumented immigrant in government custody who was denied her right to obtain an abortion by ORR. He has also been involved in coordinating meetings with religious liberty groups, pro-abstinence advocates and staffers overseeing the destruction of the Teen Pregnancy Prevention Program. Bowman and Katy Talento, the White House’s Health Policy Advisor, have worked together to overturn the Obamacare birth control mandate. Talento has over a decade of experience on the Hill where she has leveraged her positions to espouse her anti-abortion, anti-birth control views. She has publicly argued the falsehood that using birth control causes miscarriages and reduces the ability to have a baby. Goodman is a full-time anti-abortion protestor and currently engages in abortion clinic invasions with “Red Rose Rescue.” He was recently incarcerated for violating probationary requirements that he stay away from abortion clinics. Bowman and Goodman became close through their involvement with Collegians Activated to Liberate Life (CALL), which expects all of its members to take at least one full year dedicated to extremist anti-abortion activism. Goodman was CALL’s outreach director from 1996 to 1997; the two protested abortion clinics, fetal tissue research and LGBTQ rights together. Goodman and Bowman remain in touch. 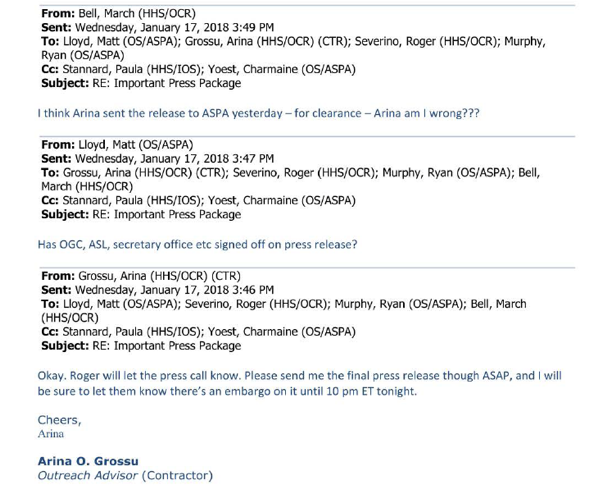 Bowman worked with Arina Grossu on the rollout of the Office for Civil Rights’ Conscience and Religious Freedom division. Grossu has been an advocate for anti-abortion groups since she was in high school. She worked as director of the Family Research Council’s Center for Human Dignity, in which she focused on anti-abortion issues. 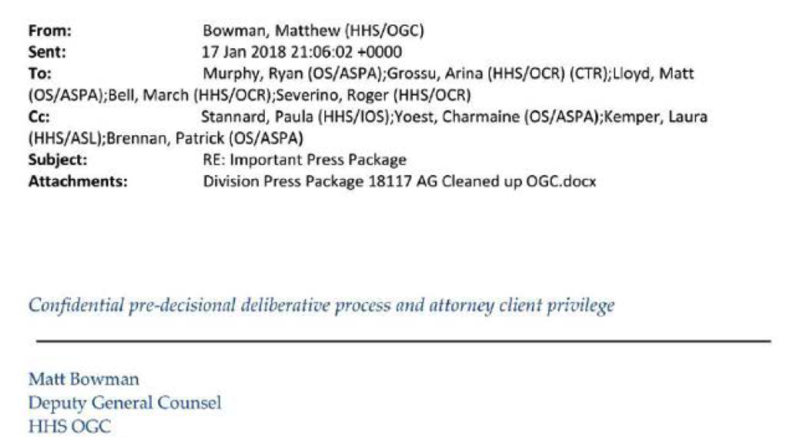 According To Emails Obtained Through Public Records Requests, Bowman Was Instrumental In Reviewing Information For The Launch Of OCR’s Discriminatory Division Of Conscience And Religious Freedom.